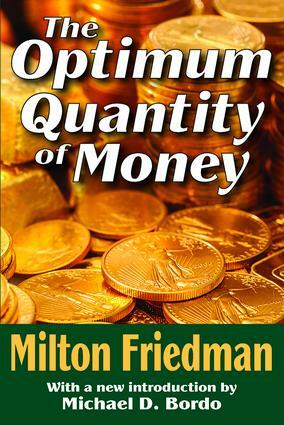 This classic set of essays by Nobel Laureate and leading monetary theorist Milton Friedman presents a coherent view of the role of money, focusing on specific topics related to the empirical analysis of monetary phenomena and policy. The early chapters cover factors determining the real quantity of money held in a community and the welfare implications of policies that affect the quantity held. The following chapters formally restate why quantity analysis has become central to the science of economics. Friedman's presidential address to the American Economic Association, included here, provides a general summary of his views on the role of monetary policy, with an emphasis on its limitations and its possibilities. This theoretical framework is used in examining a number of empirical problems: the demand for money, the explanation of price changes in wartime periods, and the role of money in business cycles. These essays summarize some of the most important results of Friedman's extensive research over the course of his lifetime. The chapters on policy that follow survey the positions of earlier economists and deal with the importance of lags and the implications of destabilizing speculation in foreign markets. Taken as a whole, The Optimum Quantity of Money provides a comprehensive view of the body of monetary theory developed in leading centers of monetary analysis. This work is essential reading for economists and graduate students in the field. The volume will be no less important for practicing business and banking personnel as well. The new statement by Michael Bordo, a student of Friedman's and an expert in the field, provides a sense of where the field now stands in the economy and academy.